More than half of Afghanistan’s population is under the age of 15. Many of the war-torn country’s children are forced to work to support their families. Without proper education, they are trapped in a vicious circle. 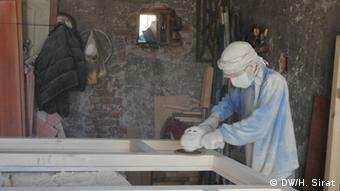 It’s scorching hot in the carpenter’s workshop. Dust and wood shavings fill the air whirled up by the powerful saw being used by 14-year-old Sattar. The young Afghan has covered his nose and mouth with a piece of cloth. Sweat runs down his forehead and his reddened eyes hint at the type of job he’s been carrying out. Sattar has been working four years in a carpentry located in the Afghan capital Kabul. For some time, he struggled to work and to attend school at the same time, before finally dropping out after the sixth grade. “I must sustain my family,” he says. “The situation back home is very grim. If we weren’t so poor, I certainly wouldn’t have dropped out.” With a salary of about a 100 Afghani a day (1,81 US dollars) he has to support his family of ten. His father is old and no longer able to support the family. Afghanistan’s Ministry of Labor and Social Affairs estimates that there are currently about 1.2 million children and adolescents under the age of 18 working in the country. However, the government has no precise statistical data, says ministry spokesman Mohammad Ali Eftekhari. According to the United Nations Children’s Fund (UNICEF), around 17 percent of the nation’s girls and 9 percent its boys between the ages of 5 and14 perform some sort of labor or service. Most of the boys in Afghanistan work either as street vendors or garbage collectors. But they can also be found in the fields growing poppy or raising livestock. Girls are primarily employed as tapestry weavers or domestic workers. But many minors also toil in brick factories (main picture) where they are exposed to potential dangers such as burns and muscular disorders. According to experts, high lead levels of lead in the clay can cause blindness. 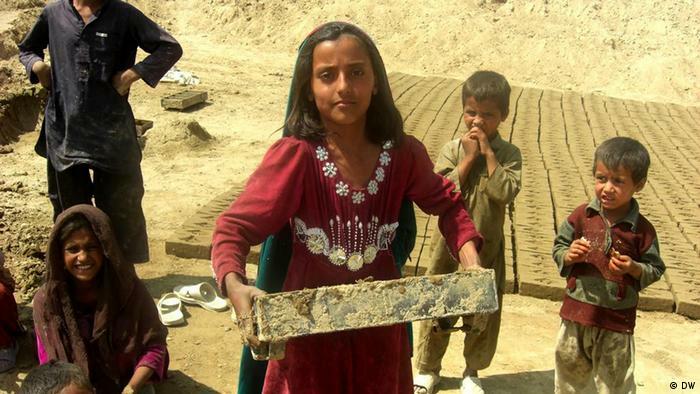 “About half of Afghanistan’s brick factory workers are under the age of 14,” says Wieland. She adds that child-trafficking and prostitution are also rampant in this war-torn country, where extremist militants use the children as suicide bombers. War has been raging in the Central Asian nation for more than three decades now. 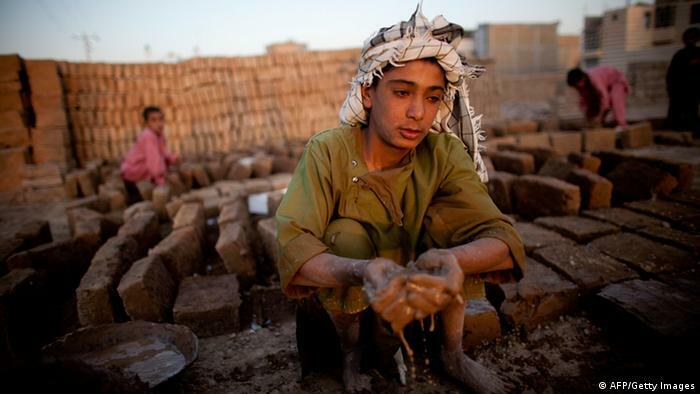 The main driving factor behind child labor in Afghanistan is poverty. This is worsened, however, by the fact that many children are orphans or grow up without a father due to the ongoing conflict. The Afghanistan Independent Human Rights Commission (AIHRC) has been accusing the government of not doing everything it can to protect children. AIHRC’s director for Central Afghanistan Shamsullah Ahmadzai told DW that Kabul had signed the UN Convention on the Rights of the Child. He criticized, however, that the aid schemes only lasted for a maximum of one year – after that, the children simply go back to work. “The government is responsible for keeping the children safe. Unfortunately, it also needs to prioritize the fight against the rebels,” said Ahmadzai, referring to the government’s struggle against the Taliban. The Afghan Labor Ministry told DW it has already worked out a strategy to tackle the issue. In the meantime, “Save the Children” has been setting up so-called bridge schools designed to offer children both education and warm meals after work. The program organizers claim to have supported more than 32,000 children already. Sattar, too, wants to take part in the scheme. “I would have a much better life if I were in a situation where I could learn more,” he says. The 14-year-old calls on the Afghan government to implement the existing laws and offer children the opportunity to attend school. Experts believe that only long-term and sustainable measures can help reduce child labor – only then will children like Sattar have the chance to learn a proper trade.